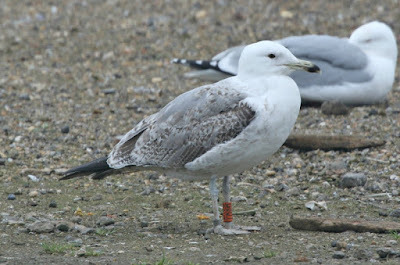 G0UT was ringed as a 1st-winter Caspian Gull at Pitsea tip, Essex on 25th March 2017 - it has the unfortunate claim to fame of being the last Caspian Gull to have been ringed there (if it actually is one). 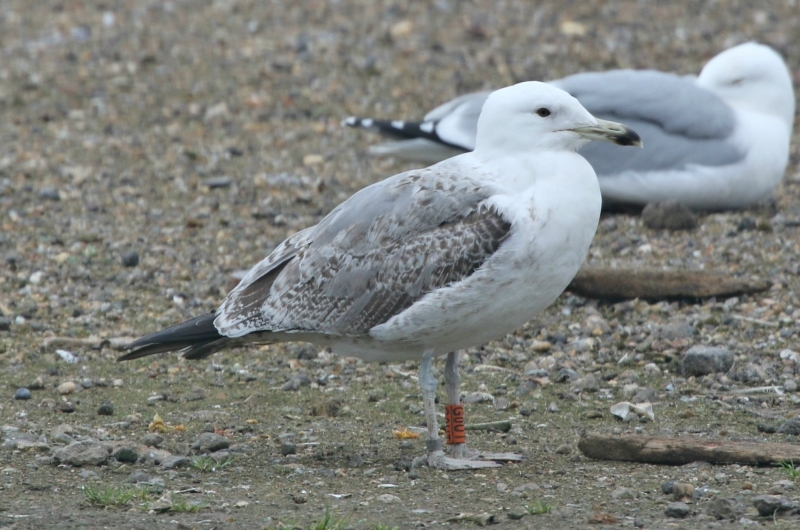 Two days after ringing Josh J had found it in west London at Hammersmith on 27th March 2017 and here, and at the nearby London Wetlands Centre, it lingered until 2nd April 2017. By 13th April 2017, it was in The Netherlands at Katwijk (photo here) and was then back in west London by 23rd July 2017 where it lingered around Fulham intermittently until last seen on 1st January 2018 - looking like this on 31st July 2017. Then it was on the east Norfolk coast at Happisburgh on 6th March 2018 before deciding to head back to the delights of Crayford last Sunday, 11th March 2018. Good history so far, and a great case study of how a relatively crap looking 1st-winter Caspian Gull gets progressively worse as it ages... be interested to track this bird into adulthood fingers crossed. 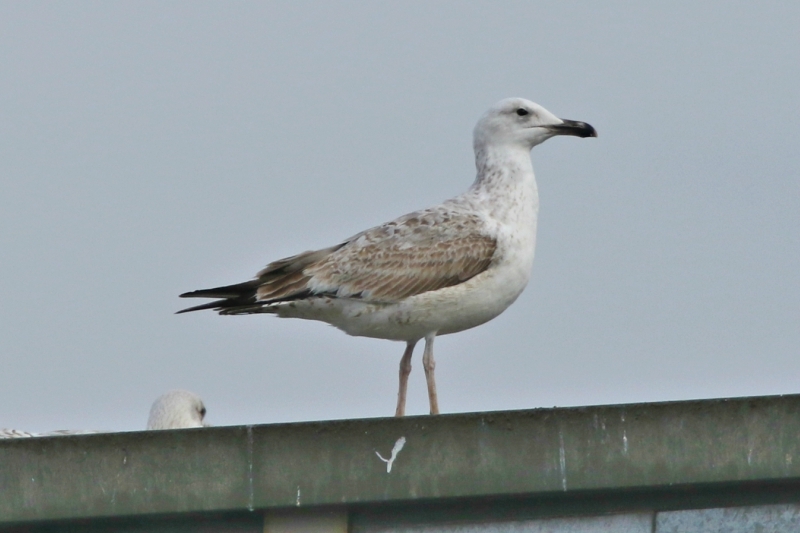 Anyway, there was a more clear cut and aggressive 1st-winter Caspian Gull on the roofs by the recycling centre briefly mid-morning - a bird I'd not seen previously so assume one that was passing through London and back to the continent. March is a decent time of year for there to be an influx of new Caspian Gulls into London, having presumably wintered elsewhere in the UK, and filtering east/southeast as they filter back towards Germany and beyond. The other site we visited on Sunday was Swanscombe Marshes - a big shout out to Barry W who gave us expert directions, with precision, which meant that I was able to see my first Purple Sandpiper in the London recording area and the lad to see his first one ever. And what's more, we managed to park in a place that meant we didn't get a parking ticket and the ever present pikeys at this site didn't nick any of my wheels! Not my fondest of sites, but with the target bird and 10 Turnstones, pretty good stuff for London. Plus a Yellow-legged Gull and Rock Pipit thrown in too for good measure. Greetings great mind, It will be my greatest pleasure saving Individuals and companies from extortion, I know not everyone will want to take it upon their self to reveal the bitter truth about online Lending because of insecurity, Time of doing it and all that. I Ryan Fletcher, an outstanding businessman who reside at Oakland, California has taken it upon himself to share this article to whom it may concern so they can learn and educate their self from it . It's bad to the extend where you see testimonies online about getting a loan and it turn out to be fake. For real i have fallen for that tricks countless time to the extend i lost almost 65,000usd in total all in the name of getting a loan to invest in a very lucrative business. After so many failed attempt of securing a loan, I and my Manager went online to do a thorough search and found this company PROSPER LOAN FIRM ( (816) 366-8769 ) but before giving it a try we also went ahead to make sure they are registered under BBB, check their reviews and also go to their headquarter to confirm their existence and capability.We were so careful because we did't wanted to lose any dime again and to our greatest expectation they deliver according to their review and grant us our desire loan amount of 510,000Usd. A word to everyone out there when it comes to Online Lenders contact only PROSPER LOAN FIRM via email: prosperloanfirm@yahoo.com or drop a message via text at (816) 366-8769 and consider all your financial problems tackled and solved. Share this to help a soul right now, Thanks. Beast from the east birding... just!